Pro player Wu Songsheng has sometimes been accused of having a "taiji style". The taiji style relies on the theory of taiji applied to go, which usually turns out to mean excessive furikawari. The cosmic style and the bean scattering styles of Takemiya Masaki and Iwamoto are not the same thing, as they may be focused on those concepts and not the *core* concept of balance. I said that there's "no real tenuki", as you might think of it. I mean that if a player makes a move worth 10 points and I respond to it, the moves are considered as a pair, and the net +/- value of the pair to the score is all that is considered. All good lines of play being evaluated by this criteria, you can discover it's not necessary to play in certain areas first, even stopping in the middle of a joseki sequence (see example below). The sequence you choose doesn't need to always change the net score compared to any possible followup he has elsewhere on the board. You might be looking for some other tradeoff, such as introduce korigatachi or aji in your opponent. If that were the case, then ending in sente would be the change in the qi of the board, even though the "score estimate" might not fundamentally change. My opponent's weak group is not surrounded, but if he tries to run, I can in theory prevent him from connecting anywhere. Therefore I should *now* perform eye stealing tesuji, instead of first trying even more to surround him. My opponent has done mochikomi but I am unsure of how to stop him. In that case, perhaps "stopping" it isn't necessary. Consider miai on a large scale. Perhaps you can employ an active defense so that in the natural course of the ensuing fight, a) the score will not change and b) several weaknesses in his surrounding positions will be exposed. Then, even if the mochikomi escapes, you can damage his own previously strong positions in a way similar to his mochikomi, without it being mochikomi on your part. very willing to give away territory for outside power (thickness, influence) in the 3rd or 4th joseki of the game when the 1st or 2nd has taken lots of profit for opponent's influence (balance of influence of territory), and vice versa. willing to play odd joseki because trying to balance territory with aji, balance influence with korigatachi, etc. in this way a more complete balance can be achieved than merely "territory for territory". For example, a leaning attack intended to create korigatachi may give you bad aji. If you read the followups to the cutting moves, if you can run away into the middle then it would seem more difficult for him to read a "honest" attack on your aji vs. you reading the pressure you are creating on his weak group to get him into korigatachi. And you can always choose the direction you like best when he does cut your stones, so setting up a whole board position might not be so difficult. considering moves in a fuseki as a form of yosumiru (probe), so that "the weaker player chooses the moves which help the stronger player win". Then several wariuchi (wedging in on the side or between enemy positions) moves which you might not have seen before become apparent. Sometimes waruichi is the proper "pro" move, depending on the global situation. I.E. moving k3 between two opposing hoshi stones is sometimes a good idea. If your opponent encloses two corners, then enclose him in the other two; or alternately allow him to enclose you in the other corners, but in such a way that he introduces weaknesses in his own shapes which you can exploit later to live in the middle. What is the value of having no aji but many kikashi (forcing moves) moves at your disposal? the lesser of the value of a ko threat, or the maximum profit your opponent can make when performing 2 moves in a row against your aji (i.e. ignoring his kikashi). Therefore aji can and should be traded against hard territory at times and in moderation. if you are the one taking territory, you can always trade it off for a bigger chunk of territory later, and let your opponent kill it. But don't over-extend and embark on grand missions to encompass the board - that is doomed to failure. If I have a weak group, or some stones with no foreseeable purpose except to run, consider abandoning them to tenuki or pressure from the outside. I have given up 7-15 stones on the top to perform a sanrensei formation on the side at an appropriate time, or to pressure from the outside, instead of trying to run simply because I can foresee the effect of the tenuki much better than either of us can foresee what will happen when my weak stones get attacked. Then, any move he makes to attack the stones I have abandoned can be considered a slack move on his part. In this style you leave as many options open as possible and look for miai everywhere (that way, you don't need to worry about those options). If this is your style, it can work for you by forcing the opponent to read far, far more than you need to, since you have already found that if he moves A, you can move B, and the score will not change much if at all. Then you can focus on the really important moves. This could be an example of a taiji joseki, where white has a stone in the upper right, especially on the hoshi point. the corner at a is open. white can b if necessary, later. However, after white b black a, the score has not changed. Therefore, you will avoid playing this miai direction. if black c you may be able to ignore it and tenuki, or simply extend again/jump up. if black d, white f and the corner at a is still open. you have damaged black's center so this is not bad for white. For black, you can ignore white b and if next white c, black g is possible. 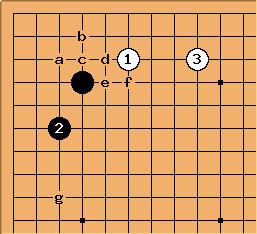 The taiji style requires re-evaluating the joseki you know and matching up moves with a "E for F" or a "B,C for G" perspective. Those match-ups don't really change the score much, if at all. Then, you can focus on the really important plays. Thats how I play it anyways. Criticism: The black d, white f exchange is a classical book example, where the exchange creates an overconcentrated shape for white, and is thus undesirable for white in many situations. -- Anon Answer: yes, you are right, it does. However, the black d/white f exchange does not fundamentally change the score, strengthens white and increases his control over the center, and also, the corner is still open. If black continues with hane underneath white's shape becomes bad indeed however white gains sente for black's corner. If black does descent instead, white can tenuki. Of course though you are right, if d/f at the most opportune time I suppose it becomes kikashi of some sort, although I've always considered black d a probe. Playing is one half of the taiji style, the way it comes about is another. Memorization (yang work) leads to formless skill (yin), this is the way of "cramming", i.e. force feeding. This yin turns to yang again, because now that you learn the values and reasons of the moves it becomes easier to memorize, i.e. memorizing your own games or pro games, and then of course the cycle repeats. Another way to think about it, is that there is in fact a yin meaning to the normally considered yang meaning of CornersThenSidesThenCenter. My taiji way of understanding it is that first you study the corners, then understand them, then study the sides, then understand them, and finally you will have an eye on the center while you play. I believe there was a recent topic somewhere (by Charles Matthews?) about "joseki on the side". Although there are no "joseki" on the side, there are common shapes there, which can be studied. Once that knowledge is incorporated, then perhaps your whole board go perception can increase. The taiji theory is one of approaching completeness, so a good taiji theory can cover the whole board. Black kakari, white 1: a possible standard response. white 1 and black 2: also standard. However, black 2 is not a true attack on white's 2 stones. White has good shape and center influence. Black has gone for corner territory. Both can go in any direction. To the taiji style player, this joseki is technically complete as it stands! White then moves 3. 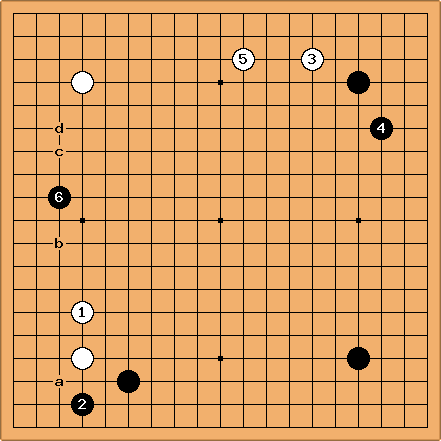 The - - joseki is described in an example above. extends back towards the hoshi stone, making an approach move against the upper left hoshi stone from that angle not good, and also allowing white to extend towards a low stone if black approaches from the left side. Therefore, this upper left hoshi stone is 'protected' from an approach move. if black approaches it, the josekis will be favourable for white. 8 and 9 are miai for black, but black must choose one and therefore white will simply take the other. play continues black A, white B, black C. White has the emergency move of D to make life but the taiji-style move is E.
Feel free to edit/add comments. Stefan: (removed -ed) kungfu: Stefan if the changes didn't answer your question please ask it again :) thanks for the input.